It’s hard to believe but as many as 50 million Americans, including millions of kids, have some type of allergy. The most common type of allergy is hay fever – also known as allergic rhinitis. Many children miss school as a result of suffering from allergies! The cost of treating seasonal allergies now tops 7 billion dollars! Many people mistakenly use the word “allergy” to refer to unpleasant experiences or reactions to things like foods or animals. We often hear someone say, “I have allergies”, “My daughter is allergic to vegetables”, “My son is allergic to school”. In reality, allergies are reactions that are usually caused by an overactive immune system. These reactions can occur in a variety of organs in the body, resulting in asthma, hay fever and eczema. How does our immune system function relate to allergies? Our immune system is the defense system for our body. It protects us against disease by searching out and destroying things that it believes to be foreign – things like viruses and bacteria. With allergic reactions however, it can attack substances that are normally harmless such as pollen or animal dander. These substances that can trigger allergic reactions are called allergens. Allergies most commonly appear in childhood or early adulthood. There is a tendency for allergies to be hereditary, or familial. If a parent, or sibling suffers from allergies there is a 25% chance that the child will have allergies. The risk is much higher if both parents have allergies. These allergies, however, can be to different substances and can have different symptons. This does not mean that allergies are absolutely hereditary. There are children with allergies that do not have allergic family members, and there are parents with allergies whose children are not allergic. Also, a child who is allergic to one substance is likely to be allergic to others as well. Dust mites are one of the most common causes of allergies. These microscopic insects live all around us and feed on the dead skin cells that fall off our bodies every day. Dust mites are the main allergic component of house dust, which is made up of many particles and can contain things such as fabric fibers and bacteria, as well as microscopic animal allergens. Dust mites are present year-round in most parts of the United and live in bedding, upholstery, drapery and carpets. Pollen is another major cause of allergies - most people know pollen allergy as hay fever. Trees, weeds, and grasses release pollen into the air to fertilize other plants. 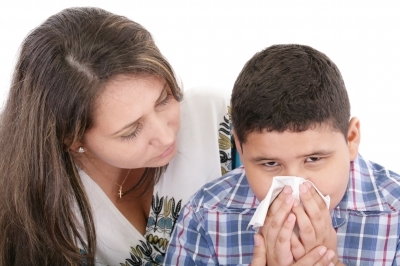 Pollen allergies are seasonal, and the type of pollen a child is allergic to determines when symptoms will occur. In our area, tree pollination begins in February and lasts through May, grass from May through June, and ragweed from August through October; so people with these allergies are likely to experience increased symptoms during those times. This past winters’ heavy snow is expected to lead to an early, and long, allergy season this year. Molds, another common allergen, are fungi that thrive both indoors and out in warm, moist environments. Outdoors, molds may be found in poor drainage areas, such as in piles of rotting leaves or compost. Inside - molds thrive in dark, poorly ventilated places such as bathrooms and damp basements, and in clothes hampers or under kitchen sinks. Although molds tend to be seasonal, many can grow year-round. Pet allergens from warm-blooded animals can cause problems for children and adults. Pet allergens are present in dander, hair, saliva, and urine. Cockroaches are also a major household allergen. Exposure to cockroach-infested buildings may be a major cause of the high rates of asthma. The symptoms allergies cane range widely. They can include itchy eyes, an itchy nose, sneezing, nasal congestion, throat tightness, trouble breathing, and even shock. Symptoms can range from seasonal problems from pollen or certain molds, to year-round problems from allergens like dust mites. Airborne allergens can cause something known as allergic rhinitis, which occurs in about 15% to 20% of Americans. It develops by 10 years of age and reaches its peak in the early twenties, with symptoms often disappearing between the ages of 40 and 60. There is no cure for allergies, yet, but it is possible to relieve the symptoms. The most important thing we can do is reduce exposure! Keep windows closed when the season is at its peak and change clothing after being outdoors. If you are allergic to mold you should avoid damp areas such as basements and keep bathrooms clean and dry. Dust mites are everywhere. Try to remove carpets or rugs from bedrooms - hard floor surfaces don't collect dust as much as carpets do. Pillow and mattress covers are a must. Try and eliminate things that can collect dust like stuffed animals, curtains and drapes. If reducing exposure isn't possible or is not effective medications can be tried. Antihistamines and nasal steroids are usually the first medications that are used. So if your child has cold-like symptoms lasting more than a week or two or if your child seems to develop a "cold" at the same time every year talk to your doctor. It may be time for a trial of medications. Testing for allergies is available as well. It can be done by skin or blood tests. Knowing what you are allergic to can aid in decreasing exposure. So after a long snowy winter let’s get ready for spring, even if it brings some allergies with it!